The new DiversaCut 2110 Dicer. A recent manufacturer’s design challenge was to create a high capacity cutter that could accept up to a 10" (254mm) maximum infeed product, have the ability to produce small to intermediate dices and take up a small amount of production floor space with a sanitary stainless steel, ergonomic design. The design concept was taken from the drawing board to the research and development of extensive in-plant testing after several years. This well-thought-out dicer first entered the market in 2003. The new DiversaCut 2110 Dicer, manufactured by Urschel Laboratories Inc., offers a high capacity while taking up minimal floor space. Strategically designed sectors separate key elements, so the food path sector is remotely located away from the gear sector and the electrical areas - a significant forward-thinking concept that adds to the overall benefits of this machine. This small in stature, rugged dicer delivers improved cut quality through an engineered compact cutting zone within the food path sector. This special design enables a smooth transition of product flow that translates into superior quality cuts. Much care and planning was taken in the design of the DiversaCut 2110 Dicer, so the machine produces a wide range of cuts at high capacity, but remains simple to operate and maintain. The wide range of cuts include: straight slices from 1/16” to 1" (1.6mm up to 25.4mm), crinkle slices from 1/8” to 1" (3.2mm to 25.4mm), circular knife cuts from 1/8” to 2" (3.2mm up to 50.8mm), straight crosscut knife cuts from 1/8” to 2-1/2" (3.2mm up to 63.5mm) and crinkle crosscut knife cuts from 9/32” to .583" (7.1mm to 14.8mm). 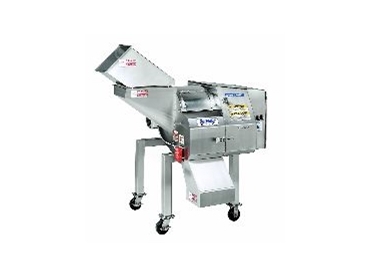 The DiversaCut 2110 Dicer accepts input product up to 10" (254mm) in any dimension. Product is delivered to a feed hopper then enters a rotating impeller. Centrifugal force holds the product against the inside of the case as the impeller paddles carry the product past the slicing knife. An adjustable case gate on the impeller case allows product to move outward across the edge of the slicing knife. The distance between the edge of the case gate and the slicing knife edge determines the slice thickness. As the slices emerge, they are guided between the slicing knife and stripper plate before entering circular knives where they are cut into strips. The strips pass directly into the crosscut knives that make the final cut. The sanitary stainless steel design encompasses hinged access panels that simplify washdowns and maintenance. The machine also features a stainless steel motor resistant to rust and corrosion available in 5HP or 10HP (3.7kW or 7.5kW). In order to save costly downtime, the machine features quick changeover of gear pulleys and other parts. Worldwide, the DiversaCut 2110 has been widely sold for a myriad of applications including the processing of whole preformed turkey roasts and hams, strip cutting of heads of cabbage, carrot and celery dices, tomato dicing, potatoes for crinkle and straight fry cuts, onion dices, bread cubing, peach dicing, and a multitude of other uses. The DiversaCut 2110 is available from Heat and Control Pty Ltd .